The article describes the history of the project from the initial notes, through various different prototypes to a device which was made available to students participating in the 2010 Student Innovation contest at the ACM Symposium on User Interface Software and Technology (UIST) in October 2010. For the contest, Microsoft provided a number of experimental Adaptive Keyboards for students to demonstrate how the combination of display and input capabilities in a keyboard could enable users to be more productive. The keys can display different legends and be dynamically remapped as required, for example, to display command icons rather than a character set. 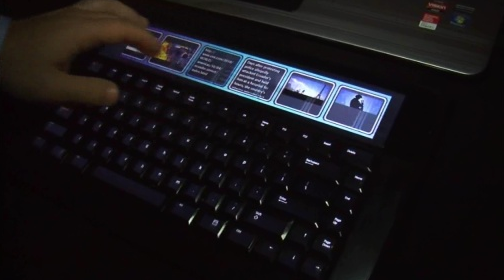 In addition, there is a touch sensitive display window at the top of the keyboard. NOTE: The Adaptive Keyboard is a research prototype not an actual product and was only made available to students participating in the UIST contest.